or pain, without complaint, loss of temper, irritation, or the like. calm and without complaint, anger, or the like. Dr. Wiki also has some interesting things to say about patience. Patience (or forbearing) is the state of endurance under difficult circumstances, which can mean persevering in the face of delay or provocation without acting on annoyance/anger in a negative way; or exhibiting forbearance when under strain, especially when faced with longer-term difficulties. Patience is the level of endurance one can take before negativity. It is also used to refer to the character trait of being steadfast. Antonyms include hastiness and impetuousness. Almost forgot, thank you to every one of you who has been with ACF from the very beginning. 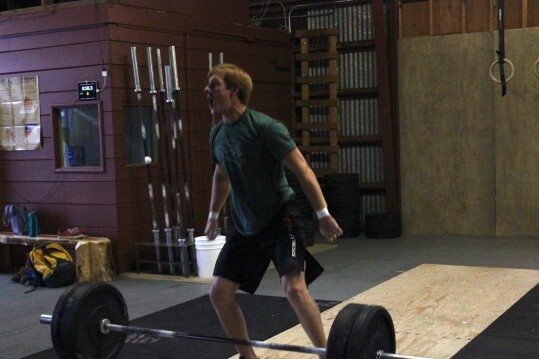 Today marks what I’m calling Auburn CrossFit’s 6 month anniversary! And thanks to those of you who have since joined and have worked your way in to this amazing community of people. I couldn’t be happier with the progress I see in Auburn CrossFit and in our athletes! I,m going to try to make it this fine day….. Dan you are not # 1 today! brilliant. I’ll be chanting that during the long row today. #4! here’s my attempt at blogging just for you Elijah. So great to finally be back, it’s been a looong month out of the box. Can’t wait to get back on track, it’s going to be a rough road. Patience eh? Yesterday was rough. . .
Congrats on your 6 months! Glad to be part of the ACF family!! Keith . . . u r lookin super fierce here! Well done . . .
kelsey we missed you at the box get back in it! Can’t beleive it’s been almost six months! Some days it still feels like day 1. I can’t say I’ve progressed as much as I would like, but that is where the patience comes in I guess. Although I didn’t keep great records from the beginning, I can tell you that I’m down a little more than 20lbs and 1-2 pant sizes. And I wouldn’t take a single day at the box back. My first day of crossfit was 4/19/12, it seems so long ago and I really need to work on my patience cause I still want to do things better and faster. Here’s to another 6 months! Congrats to your 6 month. Look forward to many more to come, love it here. It has been a blast working out with you all. Today was deceptively hard yet fun. Finished row in 7:28. Broke the L sits into 8 sets of 15 secs, and got the 100 double unders done it 4 sets (44, 28, 18, 10). Kelsey . . .. we are so glad to have you back. You truly were awesome today . . . way to jump back in with both feet! Maybe I’ll improve a little in the next 6 months. Maybeee. If you get a little more sleep you’ll probably improve by tomorrow!